So I was always a big chunky silver jewelry kind of girl, but recently (well since the engagement ring, 1930's, vintage, gold, thin etc) I have been rethinking my accessory taste and have been embracing more dainty feminine gold jewelry. 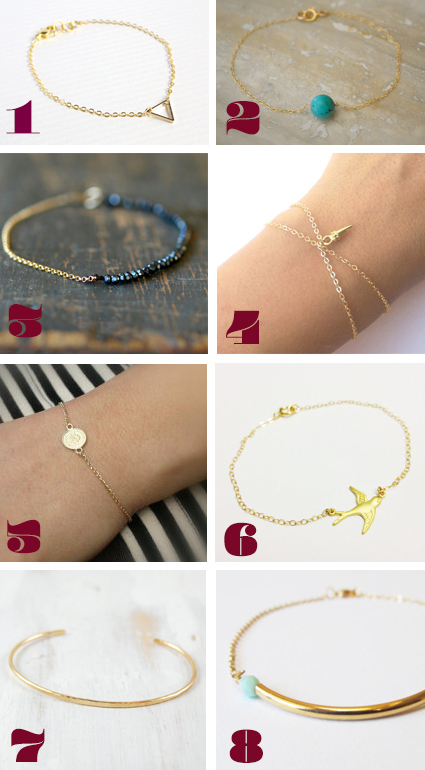 I really fancy some gold bracelets, thin simple ones that could be stacked. These are my favourite ones that I have found on etsy so far. I am particularly in Love with 1 and 7 (ahem wink wink nudge nudge NM!) but I like the way 2 and 8 introduce a bit of colour as well! Find them all here 1,2,3,4,5,6,7,8. Also can I recommend buying things on etsy. The people are really really lovely.